The discovery of this photo on my camera. A plant list for soggy and gray conditions, and a store that understands my learning curve and subsequent buyer’s remorse. An emergent reader and writer teaching me a new word for apple seeds — pips. The anticipation of a new baby mingling with the ache of arms wanted to reach more than two thousand miles in order to hold it. Yo La Tengo’s song that inspires me to knit this sweater in a beautiful yarn from a friend. Ducle de leche, a new shade of lipstick. It is perhaps a depraved taste, but I love prostitution, and for itself, too, quite apart from what there is underneath. My heart begins to pound every time I see one of those flashly dressed women walking under the lamplight in the rain, just as monks in their corded robes have always excited some deep, aesthetic corner of my soul. The idea of prostitution is a meeting point of so many elements — lust, bitterness, complete absence of human contact, muscular frenzy, the clink of gold — that to peer into it deeply makes one reel. One learns so many things in a brothel, and feels such sadness, and dreams so longingly of love! Ah, makers of elegies, it is not ancient ruins you should linger, but on the breasts of these laughing women. For a brief minute I wish to be a man so that I might have an experience such as this. Lovely, lovely, lovely. That picture is fantastic. If your home is like mine, there are probably precious few photos of you and your kids in a candid moment. What a delight to discover this one. 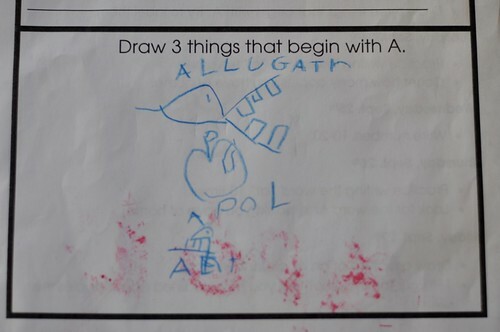 And Allugatrs and apols all around…nothing beats those early creative spellers. Happy autumn! Thanks, Andrea. You’re dead-on when it comes to photos of me with the kids because I’m usually the one behind the lens. That’s what I love about having older kids around because I can give them the camera and let them have at it, always enjoying the opportunity to see our family through another pair of eyes. Good stuff, Rachael. I like saying pips.